When my husband and I were in Athens after our cruise we ate in a little Greek restaurant and ordered a dish called bouyiourdi (pronounced a lot like boyardee). It was a baked feta cheese appetizer served with toasted bread and pita bread. My husband and I loved it and after returning home I wanted to try to make it as well. 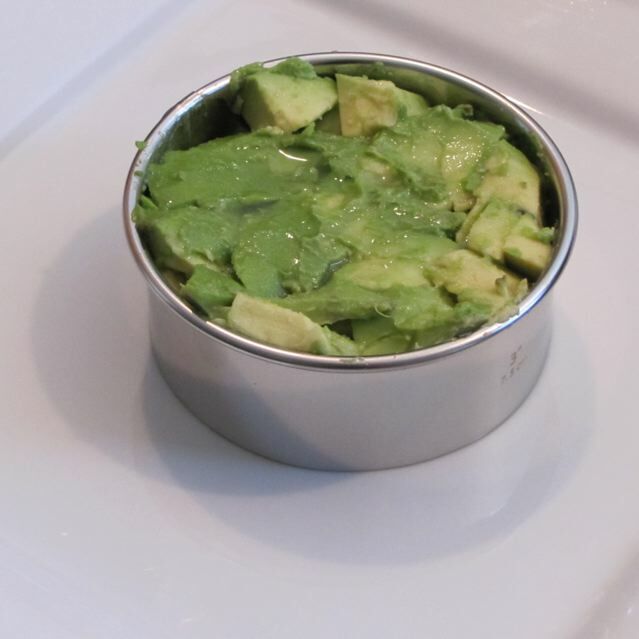 It is a very easy appetizer to make. In a small baking dish place a layer of sliced tomatoes and cherry peppers. Sprinkle with salt and oregano. Top with feta cheese. Sprinkle with oregano. Layer the top with more sliced tomatoes and cherry peppers and chopped shallots. Season with salt and oregano. Drizzle with about 2 tablespoons of olive oil. Bake at 400F for 25 minutes. Serve with toasted fresh bread or pita bread. 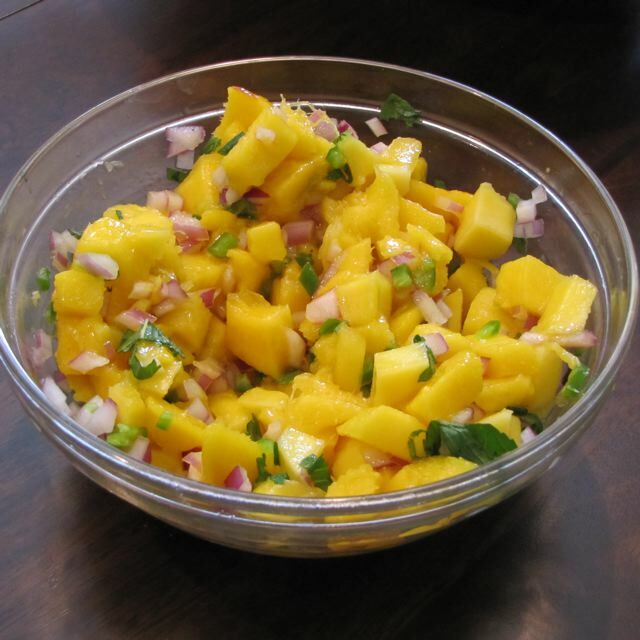 Great appetizer or lunch. Categories: Appetizers, Dips, Ethnic, Ethnic - Greek, Snack Food, Uncategorized | Tags: Baked Feta Appetizer | Permalink. I like Gorgonzola cheese – and found this dip recipe in a Health Magazine. 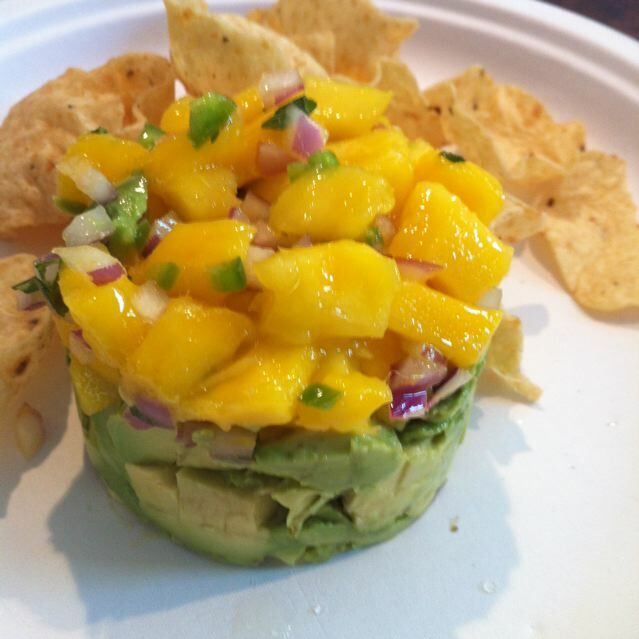 I read the ingredients and thought to myself that I should really try making a dip like this one. 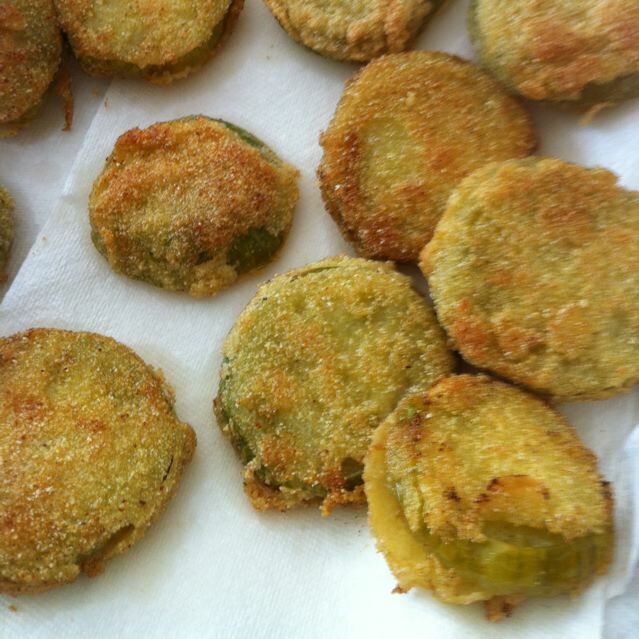 It is delicious with fresh bell peppers, cucumbers, cherry tomatoes, celery or carrot sticks. The beauty is: only 130 calories per 1/4 cup serving. You could easily use fresh herbs to this dip instead of dried. This dip is a winner in my book. Microwave the cream cheese for about 30 seconds on high (be sure to remove the lid and foil seal first). Combine all the ingredients together and stir with a rubber spatula until it is combined. 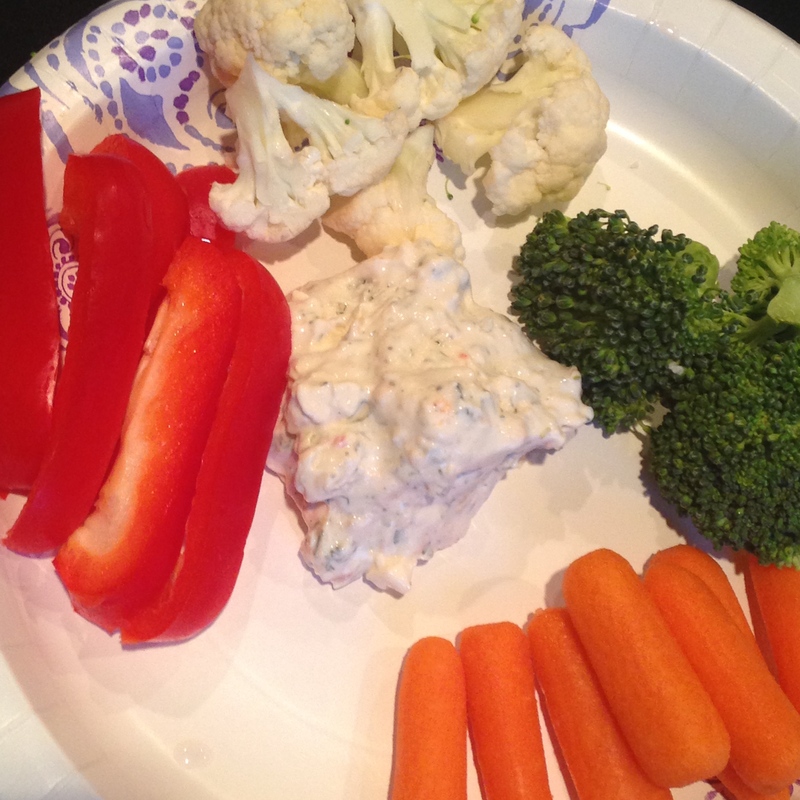 Serve 1/4 cup of Gorgonzola Veggie Dip with fresh veggies for dipping. Approximately 130 calories per serving of dip. Categories: Appetizers, Dips, Meltdown Challenge Recipes, Snack Food | Permalink. I was recently asked to contribute appetizers and a dessert for a function at our church. I love to cook, and was of course happy to help. I was a bit of a procrastinator though in planning, so I made 2 simple appetizers and a simple dessert. 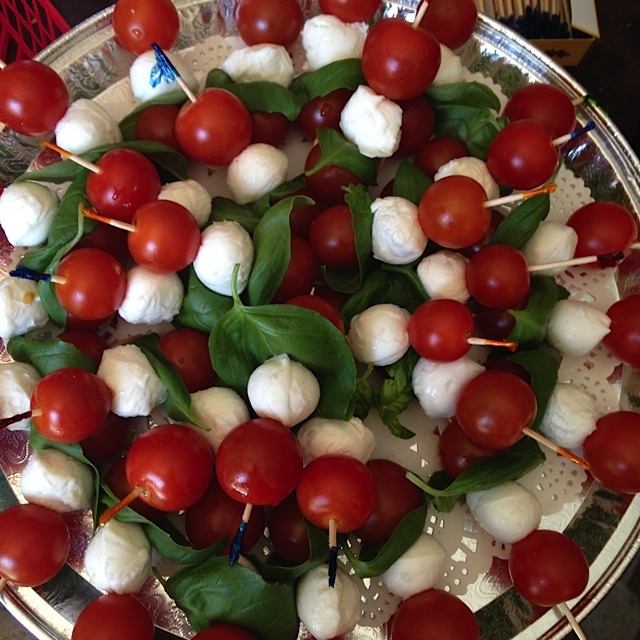 The first easy to make appetizer was a platter of skewered cherry tomatoes, mini mozzarella balls and basil leaves. A drizzle of balsamic vinegar would put i over the top, but because my appetizer would sit in the refrigerator for 3 hours before the event, I left the vinegar off. To assemble: Place one cherry tomato on the skewer, followed by a mozzarella ball, then a leaf of basil and another cherry tomato. Place along edge of a round platter and layer until you like the look. Drizzle with balsamic vinegar just before serving if desired. This is so easy! Cut the crusts of a white bread that you like. 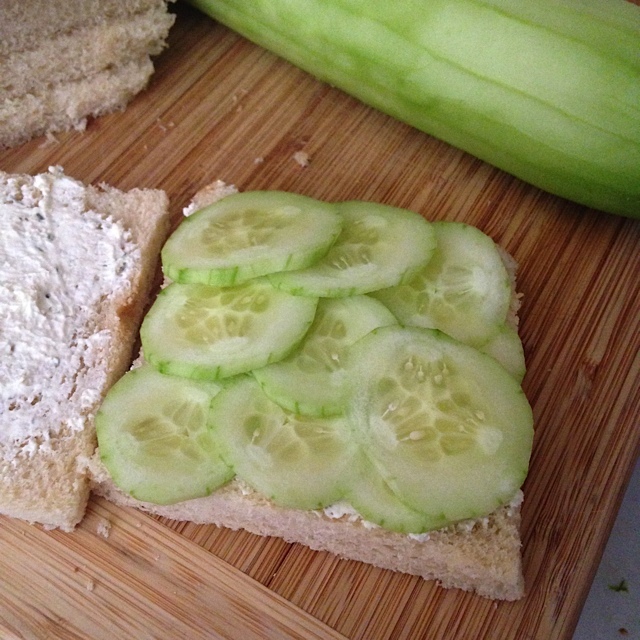 Spread one side of the bread slices with a purchased garlic spread and top with thinly sliced cucumber slices. Top with second piece of bread that also has the garlic spread. Slice diagonally. Serve. That’s it! Purchased pound cake cut into rounds (or squares) to fit inside your dessert dishes. 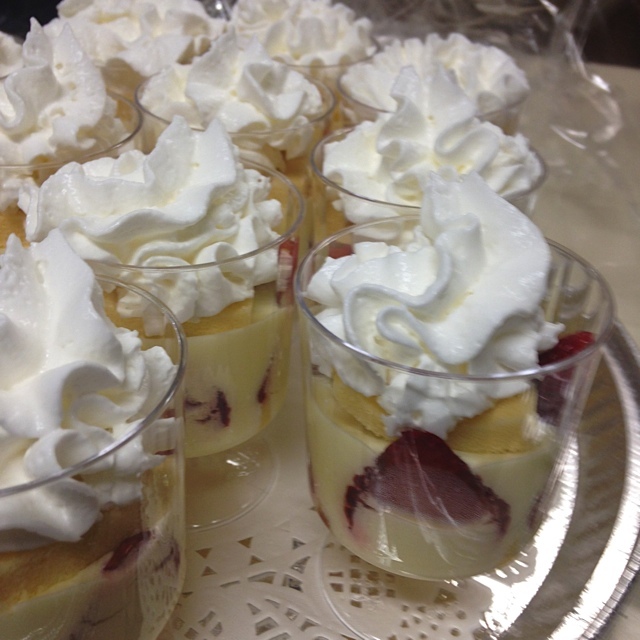 I found small 5 oz clear dessert dishes and made 24 desserts for the event. It does take a little time to assemble and chill, but look beautiful for a short list of ingredients. First cut the sliced pound cake into rounds that fit inside your dessert dish (you need 2 per dessert). Place one of the pound cake pieces in the bottom of the dessert dish. Line the sides of the dish with sliced of strawberries (cut side facing out) – my dishes were small, so I only fit 4 slices in each. Use more or less as needed. Prepare the jell-o. Mix 2 cups boiling water into a bowl with the lemon flavored jell-o. Whisk to combine. Place the bowl of jell-o into the refrigerator for 25 minutes. The jell-o will still be warm when you remove it from the refrigerator. Whisk in the thawed cool whip. Ladle 1/4 cup of the mixture into the center of the dessert dishes, try not to disturb the strawberries. Use more to cover the tips of the strawberries. Cover with saran wrap and chill for about 1 hour. Remove the desserts from the refrigerator. Remove the saran wrap and place a second round of pound cake on the jell-o. Top each dessert with whipped cream just before serving. Categories: Appetizers, Dessert - Fruit, Desserts, Snack Food | Permalink. 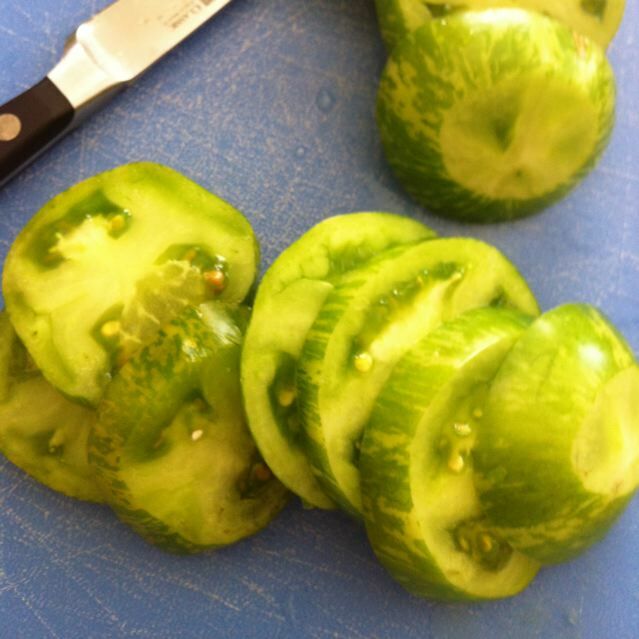 I am sorry, it is a green leafy vegetable and I want nothing of it… right? That is what you are thinking! That is what I thought, but I had so many of my foodie friends making them and raving about them so I had to see what it was all about! Guess what? They are good! No, I should say addictive! I have to play keep-away from my 10 year old son! He may love them even more than I do! I baked them in batches, and before the next batch was done, the previous ones were gone! I may need a 12 step program for these. I over salted the very first batch, but they were still good, less salt on the second batch I made and they were better. The third and fourth batches I added a quality balsamic vinegar before baking them. They were not bad, but I think the pure salt method is the way to go. The ingredient list is overwhelming – oh wait 3 ingredients. I think even my husband can handle that! I did find this recipe from Pinterest which led me to a site that had a wonderful step by step description (link). Serves 1 if you are home alone.. otherwise share with up to 3 other people. Wash the bunch of kale and then take scissors or a knife and cut the stem going up into the leaf out (almost the full length of the leaf). Tear the kale leaves into 2 inch pieces. Dry completely between paper towels, toss and dry again.. you want them as dry as possible. 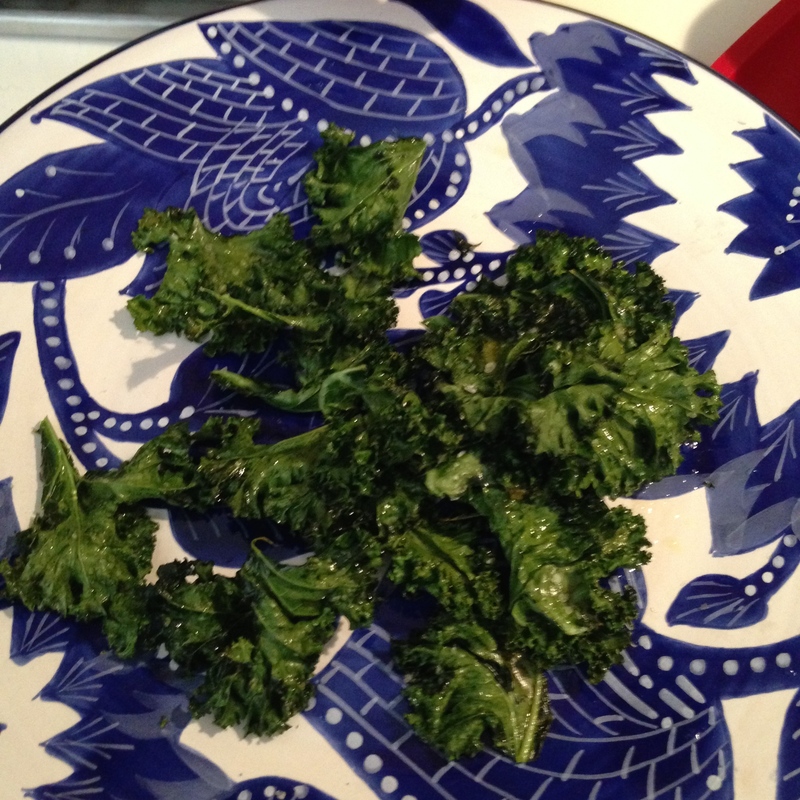 Place the kale leaf pieces in a large salad bowl and pour 1 tablespoon of olive oil over the top and toss them with your hands to get as many of the leaves as possible coated with some of the olive oil. Place about 1/4 of the leaves (as many as will fit comfortably on a silicone lined cookie sheet as possible, without overcrowding them) Grind sea salt over the leaves. Place in the oven and bake for 8 to 12 minutes. Depending on the type of kale you used it may take more or less time. Mine was the curly kale and took a little over 12 minutes to crisp up and wilt some. Remove from the baking sheet and place on a pretty plate.. they will look pretty there for about 30 seconds before the vultures descend upon the kale chips and make them vanish. Notes: Kale will end up on my grocery list a lot more in the future because of this preparation. What a great alternative to eating salty potato chips. It satisfies the salty craving and is better for you too! Will I be making these treasures again? Yes I think so, but now I am going to floss and brush my teeth because I have an appliance repair guy coming to fix my dryer! Categories: Appetizers, Baking, Eat Fresh!, GF Baking, Gluten Free (GF), Side - Vegetable, Side Dishes, Snack Food, Vegetarian | Tags: Baked Kale, Baked Kale Chips, Gluten Free Kale Chips, Kale Chips | Permalink. In your kitchen aid stand mixer, combine the ingredients listed under dough. Use a dough hook to knead the dough for about 5 minutes. You may need to dust the dough with a teaspoon of flour if it is sticking to the sides of the bowl. Scrape the dough off the dough hook and remove the hook. Dust the dough with a pinch of flour so it does not stick to the bowl and cover the bowl with plastic wrap. Allow to sit for 30 minutes. Preheat the oven to 500F (for my oven that was a little hot and the tips of the pretzels burned, so I reduced the temperature to 475F and the results were better). I prepared the pans with my favorite silicone mats. These are an excellent investment as the bottoms of items I bake do not burn. You can also line your cookie sheets with parchment paper if you do not have silicone mats. Divide the dough into 16 equal sized balls of dough. Spray a casserole dish with cooking spray or grease lightly with cooking oil and place the balls of dough in the dish. Turn to coat them with the oil. Allow to sit for 10 minutes. Take one small ball of dough and begin to roll it out into a 18 inch long snake. Dissolve 2 teaspoons of sugar in the cup of water and dip the string of dough into the water and form them into a pretzel. Place the pretzel on your cookie sheet (I could fit 8 on my large cookie sheet). Sprinkle the pretzel with a little coarse salt. Allow to rest 10 minutes before you put them in the oven. Bake at 500 (or 475 in my case) for 8-9 minutes, rotating the pans half way through cooking time. After removing them from the oven, brush the tops with the melted butter. 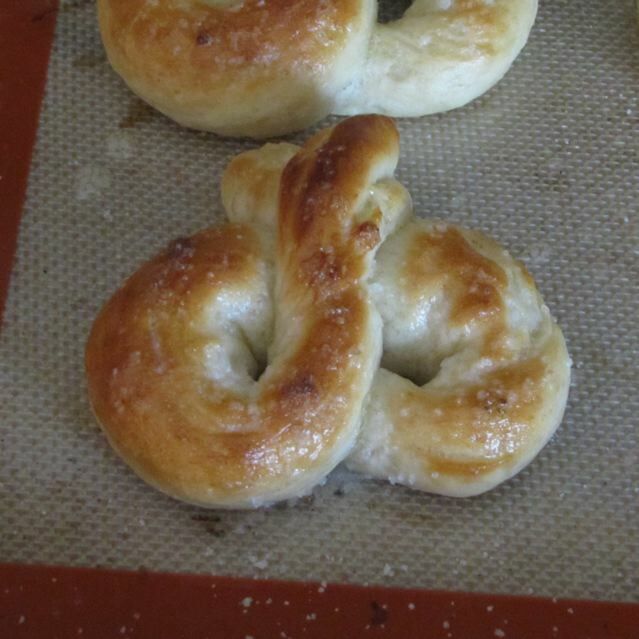 I brushed each pretzel 2 times with the butter. You really want the buttery taste to get on the pretzel. My family loved the result of this recipe. I will be making them again, even though I do not bake often. These are worth the time! And by the way, they are better and cheaper than the ones I can get at the mall. Categories: Appetizers, Baking, Baking - Bread, Snack Food | Tags: Buttered Pretzel, Homemade Pretzel, King Arthur Flour Pretzel Recipe | Permalink. My husband and I celebrated our 19th Anniversary in March and we went to eat at Peohe’s in San Diego. I bought their appetizer stack, which had three layers of goodness. 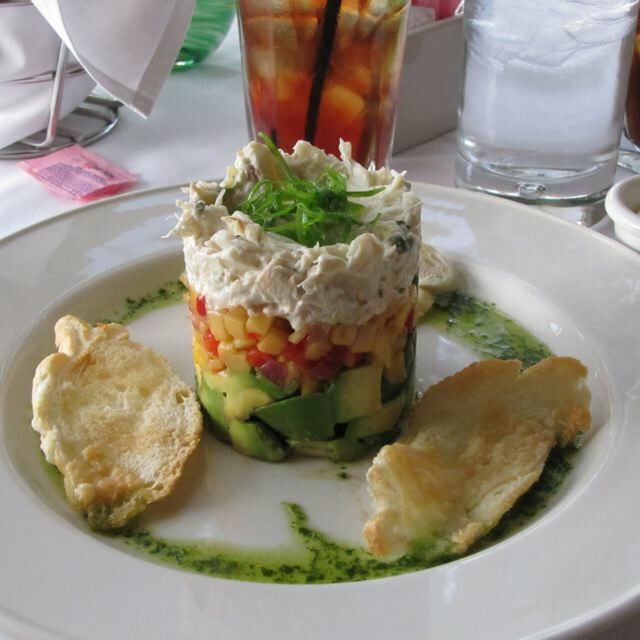 The bottom layer had diced avocado, then a layer of Mango Salsa and the top layer had seasoned crab meat (Pictured below). They had a lovely sauce drizzled around it and served them with toasted cheese toasts. It was a meal I ate with my eyes first. Their presentation was amazing! Combine the ingredients in a medium bowl and stir. You could easily change this recipe up by adding something like red bell peppers for color. 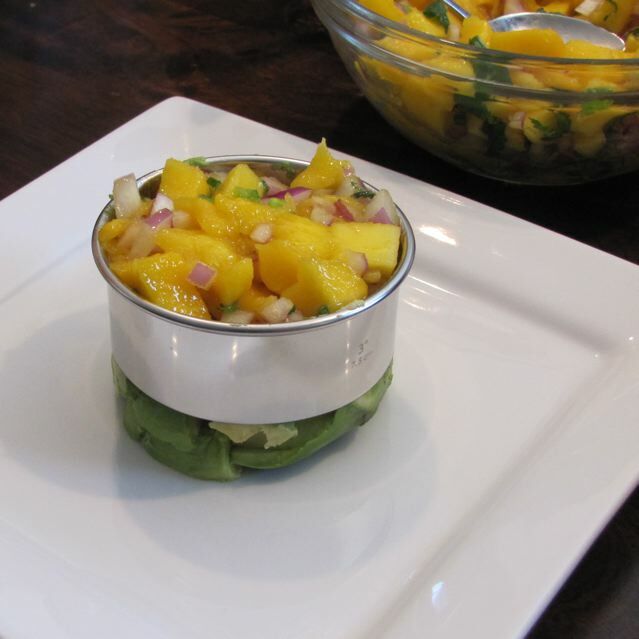 Categories: Appetizers, Dips, Snack Food | Tags: Appetizer, Avocado-Mango Stack, Dip, Mango Salsa | Permalink.